Beth Shemesh (House/Temple of the Sun [god]?) is located 12 mi. [20 km.] west of Jerusalem just south of the Sorek Stream in the Shephelah. It was situated in the buffer zone between the Philistine Plain to the west and the Hill Country of Judah to the east. It is certainly to be identified with Tell er–Rumeileh that located to the west of the now destroyed Arab village of 'Ain Shems. According to the biblical text it was on the border of the tribe of Judah (Josh 15:8–12) but allotted to the tribe of Dan (Josh 19:40–48). 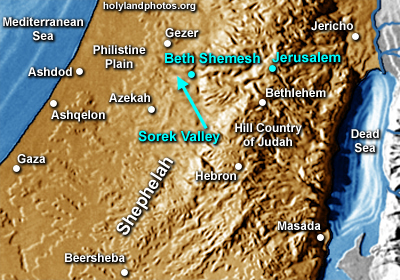 The Sorek Valley is associated with the stories of Samson and it was to Beth Shemesh that the ark of the covenant was returned by the Philistines (1 Samuel 6). It was in one of the districts of Solomon (1 Kings 4:9) and it was here that Joash (king of Israel) defeated Amaziah (king of Judah). The seven-acre mound has been well excavated by a number of expeditions. For a description of the recent excavations see Bunimovitz, Shlomo and Zvi Lederman. “Beth-Shemesh: Culture Conflict on Judah's Frontier.” Biblical Archaeology Review 23, no. 1 (1997): 42-49, 75-77.